Last weekend our visit to the steamboat Ticonderoga at the Shelburne Museum showed us how our project boats might have looked in their prime. It’s a very impressive reconstruction! Of course, this represents how Ti looked in 1923, and it was a metal hull, so its a bit more modern than what we’re looking at, but it was informative to see the machinery and how everything fit together on a Lake Champlain steamboat. It’s hard to believe but we’re already moving into our final week here at Lake Champlain. We had great weather throughout our second week and the team has been hard at work recording the steamboat hulls. 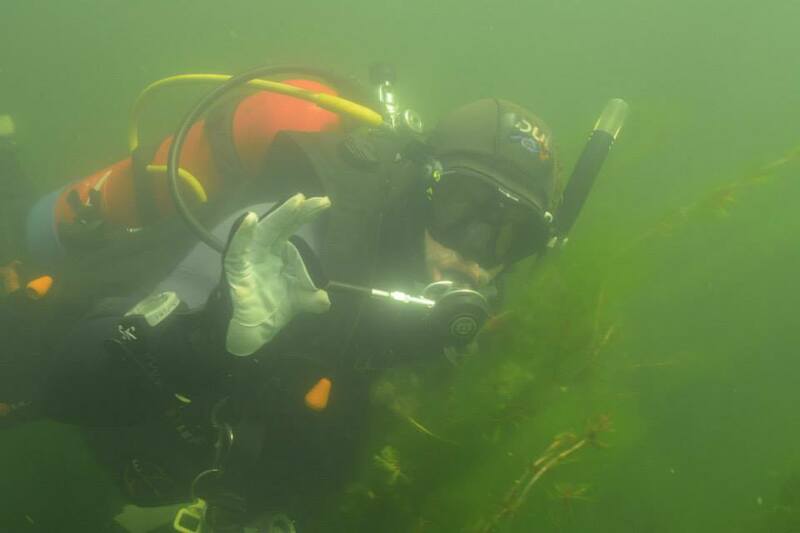 Features are becoming clearer as parts of the hull are cleared of lake debris, and some of our divers have gotten up close and personal with a few freshwater creatures including small mouth bass, perch, bow-fin, crayfish, and even a mud puppy. Still no sightings of the local lake monster, Champ, though. We’ve already had some surprises, as the hulls of Wreck 1 and Wreck 2 are shorter than expected. We know this because we found both the bow and stern for each, so we know their original lengths within a few feet. This has forced us to reconsider which Lake Champlain steamboats these might have been. Based on some more modern construction features, we believe that Wreck 1 is more recent than expected. The steamboat A. Williams is a possibility, and we’ve even discovered a photograph with its dilapidated hull very close to the location of Wreck 1. These will be interesting mysteries to solve as the project goes on! This weekend we said goodbye to our very hard working volunteer, Dan Bishop. He’s off to prepare for his up-coming wedding. Congrats, Dan! His enthusiasm was contagious and we’re definitely going to miss him in our final week. We wish him the best! Carrie Sowden just arrived today and will take over for Dan on the Wreck 3 team. This week we will focus on recording remaining frameworks, and trying to get a cross section for each hull if possible. We’ll spend next weekend trying to synthesize all the notes into scale plans for each wreck. There’s still plenty of work to do, so our team presses on!